Spanish cuisine consists of a variety of dishes, which stem from differences in geography, culture and climate. It is heavily influenced by seafood available from the waters that surround the country, and reflects the country's deep maritime roots. It is a Mediterranean diet (as per wikipedia). Since Spain is not far away from France, this cuisine is very familiar for me and i do quite often their famous Paella whenever we have a get together.Tapas and their patatas bravas ( fried potato served with tomato sauce) is our family favourite. Spanish cuisine varies depending upon the regions and most of their foods are spicy as like our Indian cuisine. 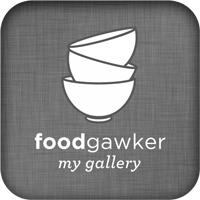 So in case if you are making any dish from this vast spanish cuisine,dont forget to send it to me. Am sharing few internet links to help you to know about this cuisine to cook for the event. Multiple entries and Achieved entries allowed if reposted. Please link you entries to the linky tool attached below this post.. Although use of logo is not mandatory,i'll appreciate if you add it in your post this helps to spread the word. I have seen rarely my kids saying no to Donuts here, especially my daughter go crazy whenever she saw donuts in our nearby bakery. Somehow i never tried my hands for making donuts at home eventhough its not a hard task when compared to bread baking. Finally, this month i got a chance to make these eggless donuts coz our this month's Baking Eggless, owned by Gayathri and the host of the month Jayanthi of Sizzling Veggies pulled us to make this incredible fried yeasted beauties.Honestly these eggless donuts tasted simply awesome when compared to the store bought ones we get here, obviously never am gonna buy them also for my knowledge store bought ones are much more expensive than the homemade ones, next time am going to make these eggless donuts as baked ones. Before few days, my kids were in vacation and obviously to keep them busy, one afternoon we started making these eggless donuts. We had loads of fun and lil one had a great time in dipping the donuts in the chocolates. We made some with dark chocolate glaze and some with cinnamon sugar, both turned out extremely addictive and it was really hard to keep ourselves away from these fried beauties. Take the yeast, a tsp of sugar in luke warm milk and let it sit for few minutes until its turns foamy. Meanwhile in a large bowl,take the sugar,butter and flour. 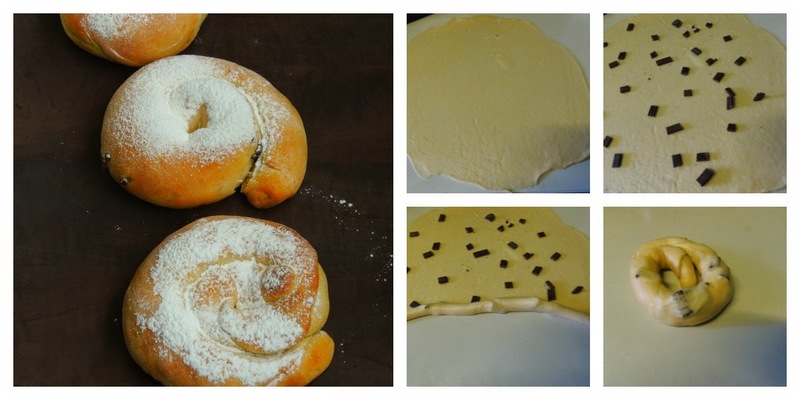 Mix them well with a wooden spoon, add now the foamy yeast and turn everything as smooth and elastic dough. Place the dough in a greased bowl and keep aside in a warm place to doube. After two hours, transfer the dough to a floured surface, roll it gently as a thick circle. 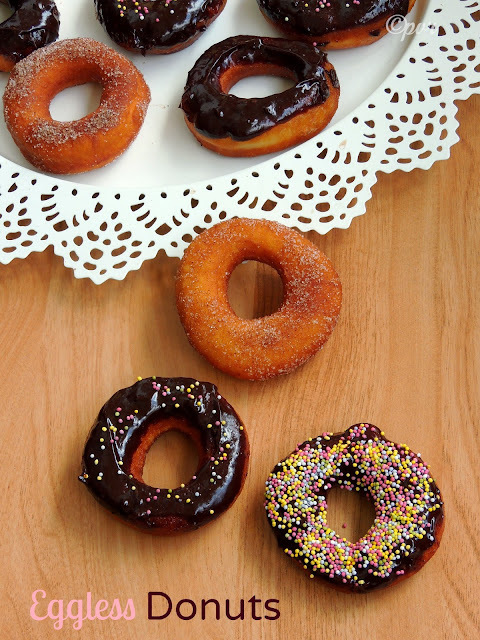 Use a dount cutter or use a small bowl to cut the donuts. Leave them again aside for half an hour to rise again. Heat enough oil for deep frying,gently slide the rised donuts to the hot oil and fry them until they turns golden brown. Mix both cinnamon and powdered sugar in a plate, roll well the deep fried donuts in this cinnamon sugar, enjoy. Take the sugar,water,dark chocolate chunks in a bowl, heat it in double boiler. Once the chocolate starts melting, add the cream and stir it as smooth and silky glaze. Dip the fried donuts in this glaze and let them sit in a wire rack. Sprinkle generously the sugar pearls and enjoy. Paris weather is neither sunny or rainy, its quite like we are living on the top of the hill. Obviously we dont run behind summer drinks or thirsty quenchers, but somehow i couldnt keep myself away from sarasparilla aka the famous nannari sharbath.Nannari or sarasparilla syrup is a body cooler and i never failed to pick them from Indian stores before the summer starts. Instead of preparing the same usual sharbath, for a change i tried adding few strawberries in our sharbath. 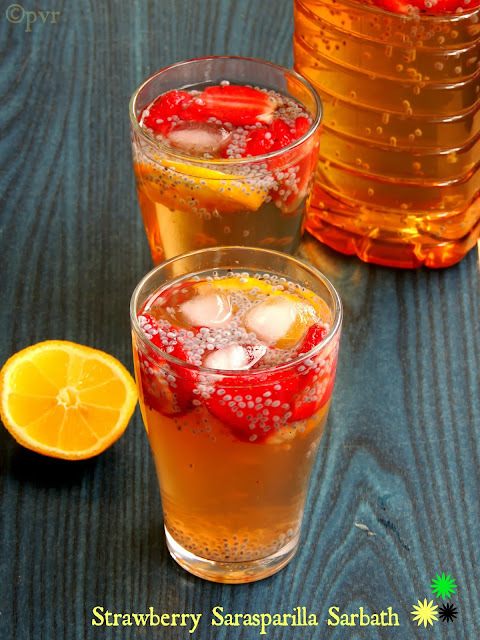 Seriously the addition of strawberries makes the difference from the usual sharbath, if you get strawberries rite now dont forget to make this drink with nannari syrup. Today am posting this drink coz am a part of this Vegan Thurdays, a group owned by me. 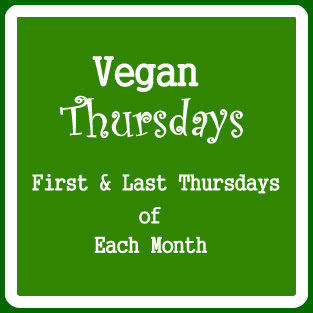 Few of my fellow food bloggers will be posting monthly twice a vegan dish on thurdays without any particular theme and main motto of this event is to share vegan dishes. Most of the Indian foods are vegan and obviously its not a big deal for an Indian to showcase some vegan foods atleast twice a month for this wonderful event. If you want to be a part of this group, do leave me your email address with your blog's name,i'll contact you through mail. Take the syrup,soaked sabja seeds, chopped strawberries in a vessel..
A quick, simple and highly flavourful one pot meal with ivygourds aka Kovakkai. Peanuts plays an important role in the spice mix i used to flavour this rice. Sorry guys i couldnt stop myself posting dishes with peanuts coz am hosting this month's cooking with seeds event with peanuts as star ingredient. Thanks to each and everyone for their contribution for this month's CWS event, since am bit hooked with few stuffs at home,i couldnt able to visit all the linked posts till today for this event. Coming to this quick rice, if you have cooked leftover rice and peanut spice mix i used in this rice already aside, you can very well finish preparing this rice within less than 15minutes, obviously you can also go for your choice of veggies somehow i felt saying that ivygourd, brinjal and bottlegourd works wonder for making this podi rice.You can carry very well this rice in your lunch box and dont forget to serve this delicious,flavourful rice simply with chips or fryums.Sending to my event CWS-Peanuts hosted by me. Roast and grind as fine powder all the ingredients given under the list 'to grind' and keep aside..
Heat enough oil in a pan, let splutters the mustard seeds,urad dal and curry leaves, add the chopped onions,saute until they turns transculent. add the chopped ivygourd,salt,turmeric powder and cook in simmer until the veggies turns soft. Now add the grounded spice powder as per need(sprinkle water if needed), cook again for few minutes.. Finally add the cooked rice, toss everything gently until the rice get well mixed. Serve it with chips,papads or any spicy side dish.. 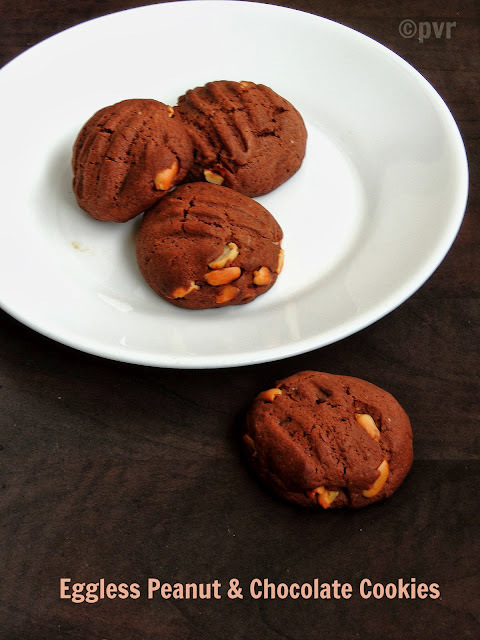 If you love peanuts and chocolate in cookies, this cookies are just for you.Beware, coz these cookies are quite addictive and definitely super buttery.If you dont care or mind about to take few pounds,coz you may gain on munching this cookies, well you can prepare them very much quickly and easily to enjoy them for an evening snacks.I just prepared them yesterday evening for my kid's snacks, needless to say my two batches of these eggless cookies vanished very much quickly..These cookies turned out very much nutty,buttery,super addictive obviously satisfy your sweet tooth. Just dip them in warm milk and enjoy these cookies, i can bet that these cookies will tastes absolutely divine.I had hard time to take a picture of these cookies, coz few hands were waiting impatiently to pick and have them..To be honest, i just got a cookie to taste, everyone at home just loved munching these scrumptious cookies.Sending to my event CWS-Peanuts hosted by me. Beat the butter until they turns soft, add the sugar to the butter,beat for few minutes. Now add gradually the flour,baking powder,cocoa powder, roasted peanuts and turns a dough. Preheat the oven to 350F, arrange a baking sheet over a baking tray. Make a small balls from the dough, flat them in your palms and arrange over the baking sheet,press on th top of cookies with a fork. Bake in middle rack for 15-20minutes or until the top turns firm. We had a windy,cloudy and rainy weekend few days back, thank god we have an electric griller at home to change this nasty weather mood to cheer up with some grilled veggies and meats. 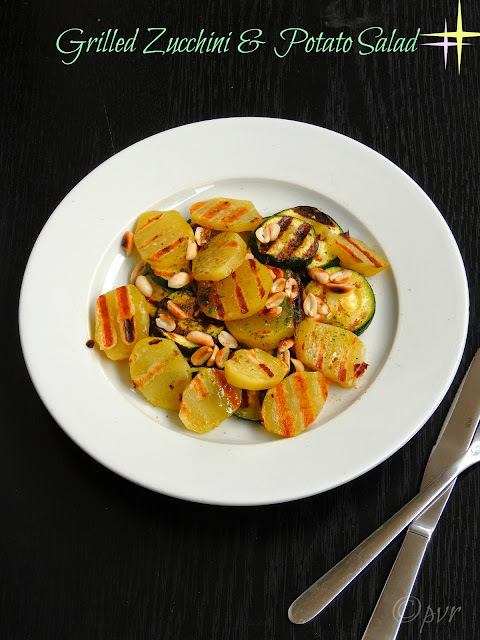 This grilled salad goes for both zucchini and potatoes, which i simply marinated with pepper powder,salt,dry herbs and olive oil before they goes for grilling. Apart from it,this salad doesnt even need any special dressing or dip to enjoy. Somehow my kids enjoyed this grilled salad with a handful of roasted peanuts and mayonnaise. A simple salad, with the zero caloric veggie zucchini and potato makes a wonderful combination for this kind of grilled salad. You can also enjoy this salad as an accompaniment with some grilled meats and bread. If you like grilled veggies, dont forget to make this salad. In case if you dont like or find zucchini,you can replace them with any kind of veggies that suits prefectly for grilling.Sending to my event CWS-Peanuts hosted by me and to my own event Healthy Diet-Healthy Salads by Archana of The Mad Scientist's Kitchen. Take the olive oil, dry thyme leaves,parsley leaves,salt,pepper powder in a bowl,mix it well. Add the round pieces of zucchini,potatoes to this mixture, stir gently until the veggies gets well coated with the spices. Keep as for half an hour. Heat the electric griller, once ready arrange the marinated veggies over the grill and grill them until they get well cooked. While serving, take the grilled veggies in a plate, sprinkle the roasted peanuts and serve. You can have this salad both chilled or slightly warm. If you want something really very quick, mildly spicy and a tangy crispy potatoes, you should definitely try ur hands in making this beauties. 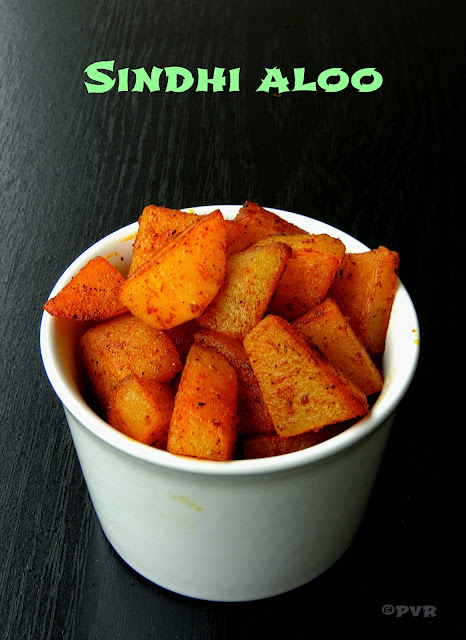 Sindhi aloo takes hardly less than 20 minutes to get ready, an excellent side dish or snacks to enjoy just like that. 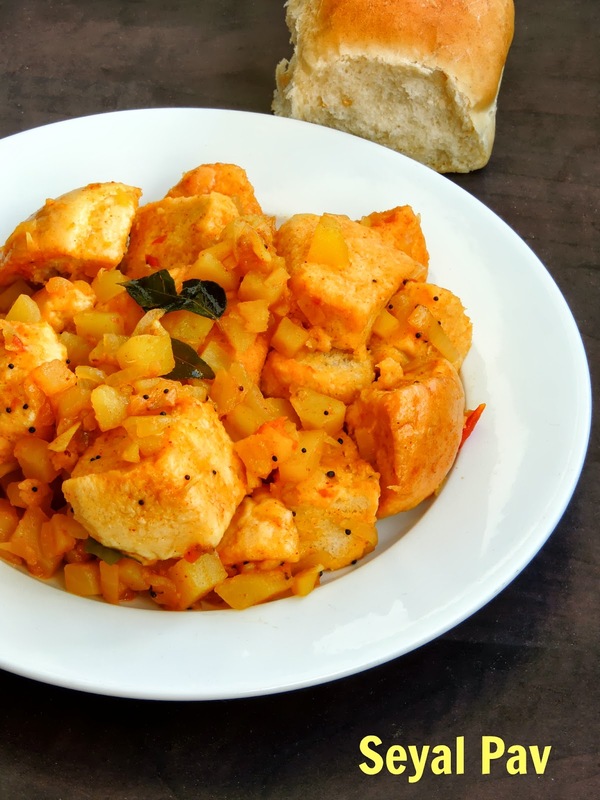 Eventhough this sindhi aloo may sounds very simple, the spice mix used in this dish will definitely makes the difference.I picked this Sindhi aloo from Vaishali's space and thanks to her for sharing this incredible aloo fry. 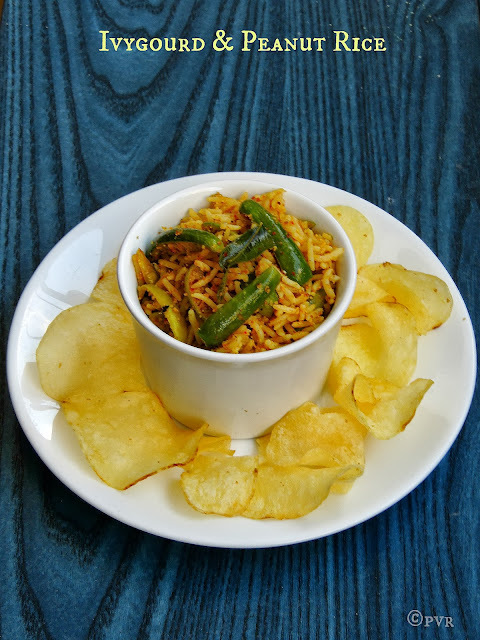 We relished this quick and super crispy potato fries with Sindhi Sytle Khichdi with some mango pickle. My sindhi aloo will be bit colourful when compared to Vaishali's fry coz i used Kashmiri red chilly powder in this fry,apart from it i didnt changed anything and followed the recipe given by Vaishali. Vaishali says that these Sindhi aloos are absolute favourite of all Sindhis, no way Vaishali its an absolute favourite for us too. Its really wonderful to learn many beautiful dishes from other cuisine, i enjoyed thoroughly cooking three different dishes from the famous Sindhi cuisine as i chosed this wonderful cuisine as this week's theme of blogging marathon. Check out the Blogging Marathon page for the other Blogging Marathoners doing this 28th edition. Heat oil, add the cubed potatoes,sprinkle the salt and fry for few minutes. Cover and cook those cubed potatoes in slow flame until they gets cooked. Remove the excess of oil from the pan. Spinkle the spices ,cover and cook again until the potatoes gets well coated with the spice powders. Bread have their important place in our daily menu, we cant start a day without a bread or finish our dinner without the famous french baguette. Bread is quite a staple food now for us. When i chosed Sindhi cuisine for this week's blogging marathon, i was bloghopping to make something different with breads or buns from this beautiful cuisine. Finally i landed again at Alka's Seyal Pav and i immediately got hooked to this beautiful dish. 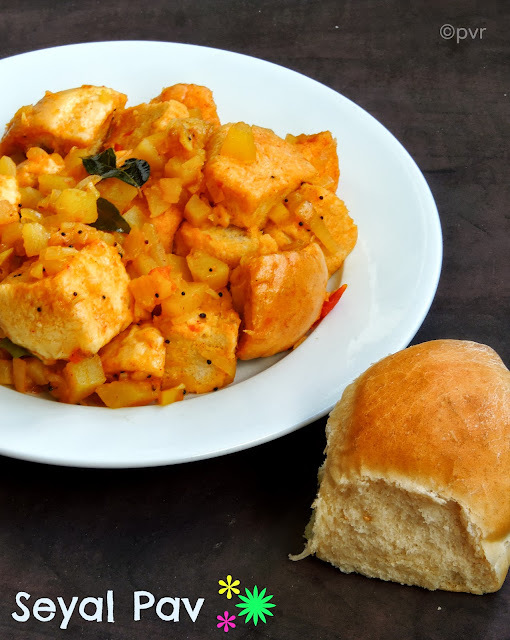 Seyal pav is a Sindhi breakfast dish prepared by cooking dinner rolls with potatoes,onions and tomatoes with usual spices.Alka says that seyal refers to the method of cooking both onion and garlic with little water or sometimes without water. Since i get sweet brioche kind of buns here, i prepared my pav aka dinner rolls at home itself. Seriously everyone at home enjoyed thoroughly this seyal pav for their dinner as we dont have Indian foods for our breakfast, no matter you enjoy this seyal pav for dinner or breakfast am sure this seyal pav will definitely satisfy your tastebuds.Check out the Blogging Marathon page for the other Blogging Marathoners doing this 28th edition. Take enough oil in a pan, add the chopped garlic cloves and saute for few seconds. Now add the mustard seeds,curry leaves and let them splutter. Once the garlic turns slightly brown, add the chopped potatoes, fry for few minutes. Now add the chopped onions and saute everything again for few more minutes. Add the grated tomotes,slit opened green chillies,turmeric powder,red chilly powder,salt and cook until the oil gets separates. Finally add the cubed pav buns to pan, mix them gently until the water gets absorbs. Cook in low flame for few seconds and put off the stove. Serve with your favourite side dish or papads. After pull apart bread,croissants,hokkaido bread and torcettini cookies, we are here with an another bread, something interesting and savoury as well, yes this month's We Knead to Bake is this beautiful Bialys, an incredible monthly baking event b Aparna. The bialy is pronounced as bee-AH-lee ressembles like bagel but its quite diferent from it. Bialys are baked while bagels are boiled and then baked. Bialys are chewy rolls which are round with depressed middle not a hole and usually filled with cooked onions or else sometimes onions with poppy seeds.People enjoy bialys with butter or cheese but i felt that bialys without any spread itself tastes fabulous. The name Bialy comes from Bialystocker Kuchen which translates as bread from Bialystok from Poland. Bialys are rarely seen or made in Bialystick nowadays, but earlier its seems that this Bialys are eaten by rich Jews with their meals while its was the whole meal for the poor Jews. In early 1900, many Eastern Europeans including Polish immigrated to US and settled down in New York, obviously they also brought their Bialys making skills with them and that is how the New York Bialys are famous. 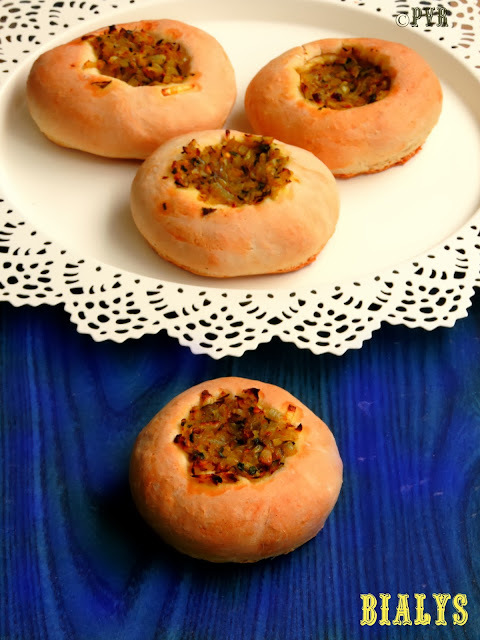 Bialys will have usually a thin layer of caramelised onions and poppy seeds, but i prepared my caramalised onions with dry fenugreek leaves and garlic.And this filling was amazing with a wonderful garlic and dry fenugreek aka kasuri methi flavour. Take the yeast,sugar,salt and flour in a food processor,pulse it and add the warm water in a steady stream. Knead until the dough comes together and let the dough rest for few minutes, this way the dough will absorb the water. Knead again by adding little water or flour if needed until the dough turns smooth,elastic but not sticky. Trasner the dough to a greased bowl,cover it and let it sit in a warm place to double. Meanwhile,heat oil in a pan, add the crushed garlic, saute for few minutes, add the onions and cook in medium low flame. Sprinkle some salt and saute until they turns golden brown in colour, finally add the crushed kasuri methi and put off the stove. Keep aside and let this caramelised onions gets cool. After 2hours, take out the doubled dough and divide into 8equal pieces, dust the pieces with enough flour and roll them as smooth balls and keep aside for an hour. When the rolls are ready, pick up one and using fingers form a depression in the middle. Hold the roll like a steering wheel with ur thumbs in the middle and your fingers around the edges. Pinch the dough between your thumb and fingers, rotate it, gradually make the depression widers without poking a hole. Once shapped, prick the centre of the bialy with a fork, transfer it over a baking sheet lined over a baking tray and fill it with already prepared onion filling. Brush the outer dough generously with milk. Bake bialys at 230C for 15 minutes till the crust turns golden brown. Cool them and serve when they are slightly warm or at room temperature. I have tried couple of dishes from Sindhi cuisine, somehow i feel very comfortable to make dishes from this cuisine eventhough this cuisine was quite unknown for me before entering into this virtual world. Thanks to this bloggy world,been born and brought up in South India, many North Indian dishes are quite unfamiliar even today for me.I learned, still learning and will learn many dishes and cuisines from this tremendous blogger world. You may wonder why suddenly Sindhi style khichdi, coz am running a week of blogging marathon from today and my theme for this week is Sindhi cuisine. For the first day of this week's blogging marathon, i prepared a Sindhi style khichdi which i picked from Alka's Sindhi Rasoi.This khichdi goes as usual rice and lentils combination but this Sindhi style khichdi will be bit watery and mushy when compared to the other cuisine's khichdi.Simple dish prepared quickly with few ingredients, this khichdi tastes wonderful when served with a dash of ghee and with some pickle. Patri Khichreen is a light meal to relish without any guilt and definitely delicious as well as healthy.I served patri khichreen with grated mango pickle and sindhi aloo.Check out the Blogging Marathon page for the other Blogging Marathoners doing this 28th edition. Take the rice and husked green gram together in a vessel, wash well and soak for 15minutes, drain and keep aside. In a pressure cooker, heat the oil, add the peppercorns,green cardamoms,rice -dal mixture, saute for few minutes. Add the water,salt,turmeric powder,close the cooker with lid and cook for 5-6whistles. Once steam released, mash the khichdi, the consistency of this khichdi will be liquid. Serve it immediately with a dash of ghee with papads,pickles or with spicy potatoes. Just like usual dals, this peanut and kasuri methi dal goes for a quick preparation and tastes very different from the usual dals.This dal goes awesome with rice as well as with rotis. Peanuts gives a wonderful crunchiness to this dal while kasuri methi leaves gives an excellent flavour to this simple dal. 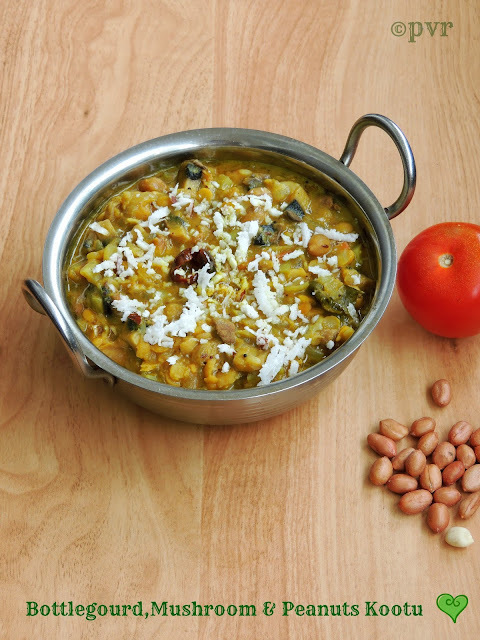 This dal is quite easy to prepare with less efforts and you can also add other veggies to this dal to make them much more healthier. I used tamarind paste in this dal, thats why the colour of this dal is bit dull when compated to the usual dal. 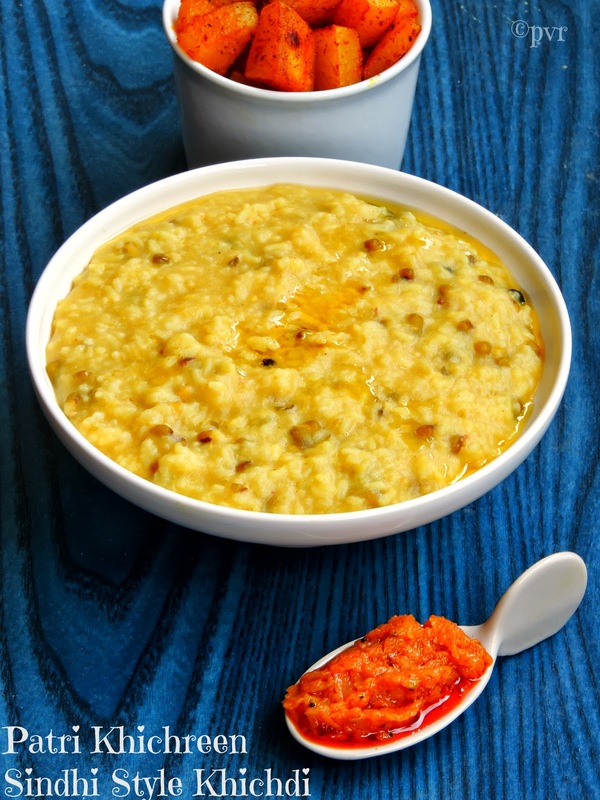 A simple,mildly tangy and delicious dal to enjoy with your favourite side dishes and rice. I used toor dal for making this dal, you can use any dal of your choice but somehow i felt that toor dal tastes much better when compared to moongdal or masoor dal.Sending to my event CWS-Peanuts hosted by me. Wash both the toor dal and raw peanuts together, take them in pressure cooker along with green chillies,turmeric powder,salt and enough water. Meanwhile in a pan, heat the oil let splutters the mustard seeds,urad dal,cumin seeds.. add the asafoetida powder, dry red chilly and curry leaves. Once the pressure gets released, mash slightly the dal, add the crushed kasuri methi, tamarind paste and bring the dal to boil. Finally add the tempered spices to the dal and put off the stove. Put off the stove and serve immediately. Last month for some reason i couldnt able to participate Defi Boulange, a fabulous bread baking event by Nadia and Manue. But this month i dont want to miss their incredible challenge, our this month's challenge is this ensaïmadas from Majorca. Quite a new pastry for me and when i saw the announcement of this ensaïmadas i know i'll be making these beauties without any fail.Its seems this pastry is quite common in Majorca,Spain and Peru.Its a typical pastry product and they are quite often made during festivals and celebrations in Majorca and Spain. These ensaïmada is prepared with strong flour,water,sugar and eggs with a reduced pork lard named saîm, fortunately both Nadia and Manue suggested us to use butter in case if we dont find this saïm, thank god that i could make this pastry with butter. Usually this pastry is prepared simply with this famous saïm but nowadays we can find many stuffed ensaïmadas, obviously i baked mine with chocolate chunks.You can also prepared ur ensaïmadas with any filling of your choice, my next trial is with nutella or else with pastry cream. 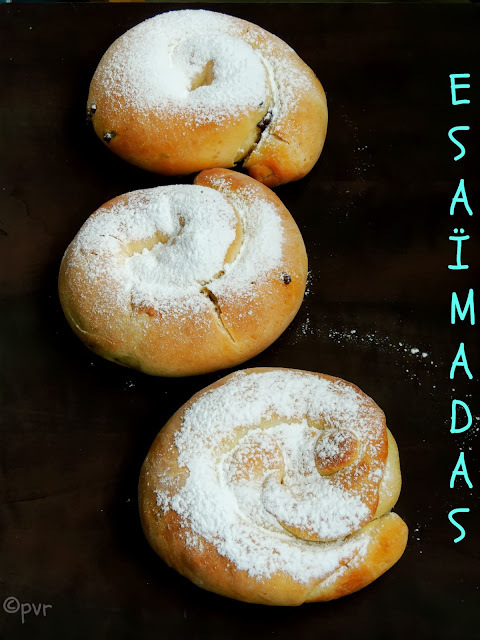 This ensaïmadas tastes fabulous with a cup of coffee and an excellent pastry to start a day. Thanks again to defi boulange for pulling me to make this wonderful pastry from Majorca. In a large bowl, take the flour,sugar,olive oil,salt and add the crumbled fresh yeast, add the luke warm water and beaten egg. Knead everything for 10minutes until the dough turns soft and elastic. Transfer the dough to a greased bowl and cover it, leave it aside for 2hours until they double their volume. Take the doubled dough,punch down the dough and divide the dough as 4equal balls. Grease the kitchen counter and roll the dough ball as a large oval circle. Brush the circle generously with the melted butter and try to roll the circle as thinner as possible. Now sprinkle the chocolate chips as per need, roll an edge of the circle and form a long log. Now roll again the log as spiral form or snail like form without rolling them tightly. Transfer this unbaked ensaïmadas to a baking sheet lined over a baking tray and let them sit in a warm place for an hour. Bake this ensaîmadas for 15-20minutes in middle rack until the crust turns golden brown. Let the ensaïmadas gets cool slightly, dust them generously with the confectioner's sugar. Arrange them in an air tightened box. These ensaïmadas are quite addictive and beware of them. My grandma prepares wonderful eggplant curry with peanuts, obviously we never failed to make eggplant curries with peanuts. For a change,i tried my hands in making a wonderful,flavourful gravy with peanuts and coconut paste. 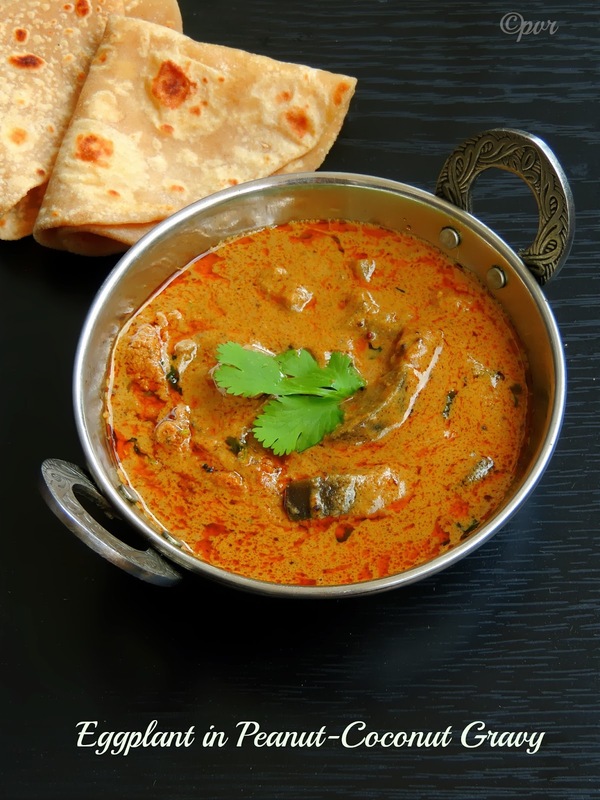 Serve this gravy with rice, you can have an extra plate of rice with this nutty,delicious gravy. Also this gravy works out wonder even along with simple phulkas or parathas.We get eggplants easily here thats why i usually skip our usual Indian variety brinjals if the recipe asks for brinjals. Since i used eggplants i didnt stuffed them and this gravy goes for small eggplant chunks. Seriously i love small cubes of eggplants than the stuffed brinjals in my curry,if you want to replace the eggplants obviously you can go for the small brinjals.Sending to my event CWS-Peanuts hosted by me. Soak the tamarind in warm water and extract the juice from it. Heat enough oil in a pan, add the onions,garlic,peanuts,dry red chillies,coconut and fry everything in simmer until a nice aroma comes from. Once cooled,grind them together as smooth paste. 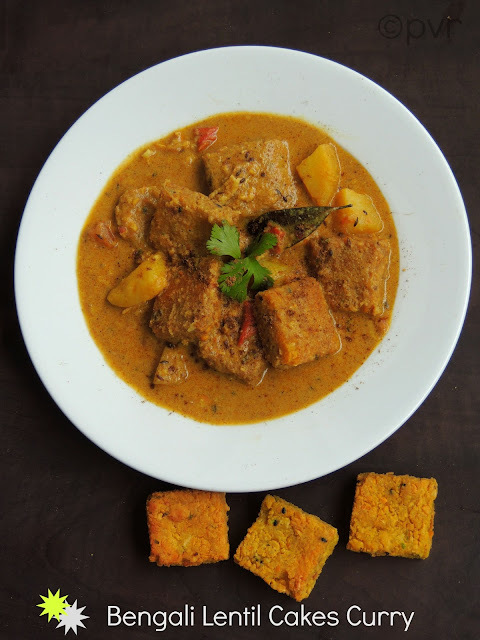 In the same pan, add enough oil again, let splutters the mustard seeds,asafoetida powder, add the cubed eggplant chunks, turmeric and fry for few minutes. Add the grounded paste and saute for few more minutes. Now add the tamarind juice,coriander powder, garam masala powder,salt,water (if needed) and cook in simmer. Cook everything until the oil gets separates from the gravy. Garnish the gravy with coriander leaves and serve with rice. Banana and peanut butter makes a prefect pair in smoothies. This is one of our family favourite combo in smoothies, i can drink litres and litres of this smoothie, yep i love it that much. Smoothies are quite filling and definitely its my kind of breakfast drink.Am not breakfast person obviously i love to blend fruits with grains or veggies to make a healthy drink whenever i feel lazy to prepare my breakfast.Even these kind of smoothies works wonder when we are in hurry. If you are yet to try this wonderful smoothie, dont forget to give a try. Am sure you guys will definitely love this nutty as well as very fruity drink at anytime of the day. 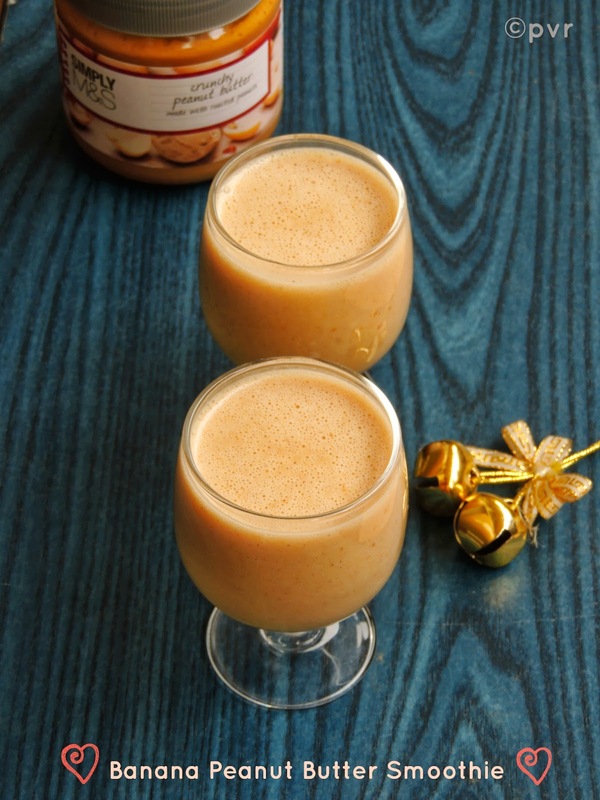 You can also make a shake with few scoops of banana icecream or vanilla icecream,but however i found that an over ripen banana and a spoon of peanut butter makes a wonderful and filling smoothie.Sending to my event CWS-Peanuts hosted by me. Take the chilled milk,banana,peanut butter,sugar or honey in a blender. Raw mango rice is one of my favourite rice dish as like lemon rice. But dunno why i havent posted my favourite rice till now in my space. Since i chosed mango for this week's blogging marathon as theme, this time i dont want to miss to post our family favourite mango rice.This raw mango rice is cooked with grated raw mango and the tanginess for this rice comes from the raw mango and there is no need to add lemon juice in this rice. We make two version of mango rice, one version is to mix the cooked rice with grated raw mango and the another version is cooked rice mixed along with raw mango paste and then seasoned. Obviously for the second version,the seasoning plays an important role while in the first version, the grated raw mango itself plays a fabulous role. Tangy raw mango will works out wonder for making this mango rice. 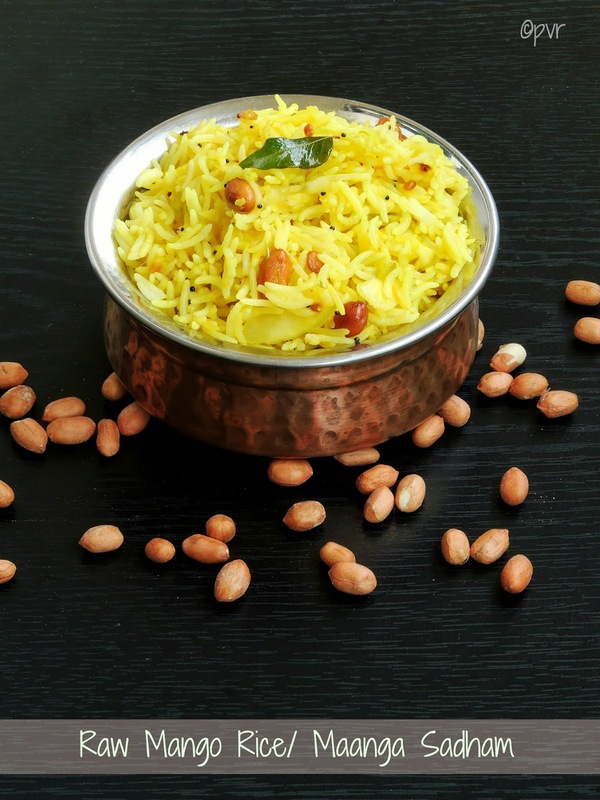 I usually add the peanuts in the tempering and the addition of peanuts gives a fabulous taste to this rice.If you dont like peanuts, you can also add cashewnuts in the tempering. Take the rice, grated raw mango in a flat plate, add the salt and mix it well. Heat enough oil in a big pan, let splutter mustard seeds, then add the urad dal,channadal,dry red chillies,asafoetida powder,peanuts and keep frying. Now add the curry leaves,slit opened green chillies,turmeric powder and cook for few minutes. Add immediately this tempered spices to the already mixed rice and mango mixture. Serve warm with some fried papads. I dont want to say again and again that most of our dinner will be either salads or soups. For this week's blogging marathon, am posting this quick,easy peasy and mildly tangy salad as my choice of theme for this week is 'Mango'. In my previous post, i said that mango are showing their head in Indian groceries here and we couldnt resist to them and i picked some fresh raw mangoes from there few days back. Seriously i never tried my hands in salad with raw mangoes, this time i really want to give a try and finally i did. Trust me, if you are mango lovers like me, am sure that you will definitely go crazy after having this salad. 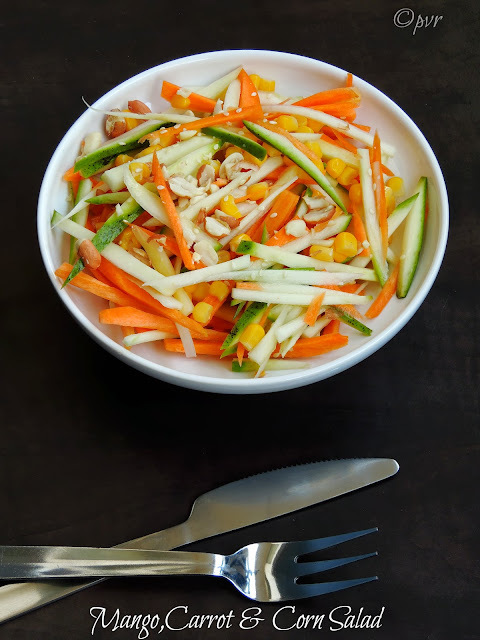 Sweetness of corn and carrot balance very well the tanginess of the raw mango and the crushed peanuts,sesame seeds gives a wonderful flavour to this simple salad. I didnt prepared any special dressing for this salad,just served them with salt,white pepper powder and olive oil. Give a try friends, am sure you guys will definitely love this fabulous salad.Check out the Blogging Marathon page for the other Blogging Marathoners doing this 28th edition.Sending this salad to my own event Healthy Diet-Healthy Salads by Archana of The Mad Scientist's Kitchen and to my another event CWS-Peanuts hosted by me. Take the julienned raw mango pieces, carrot pieces,sweet corns in a bowl,give a mix. Now add the crushed peanuts, sesame seeds to the veggies,give a mix. Meanwhile take the salt,pepper powder,olive oil in a bowl,mix it and keep this dressing aside. While serving the salad, add the already prepared dressing generously to salad, give a mix and serve. After a small break from this blogging world, am here with a fingerlicking mango pickle with raw mangoes. Am running blogging marathon with dishes prepared with mangoes as theme for this week,obviously the next two days is going to be dishes with mangoes. Its peek mango season in India and obviously we are getting some super fresh mangoes in all Indian groceries here. This time i picked a couple of super fresh raw mangoes from the Indian store and prepared this most awaited grated mango pickle.This fingerlicking, tongue tickling pickle will gets ready very quickly. Needless to say this grated mango pickle is an instant pickle to relish with any foods. 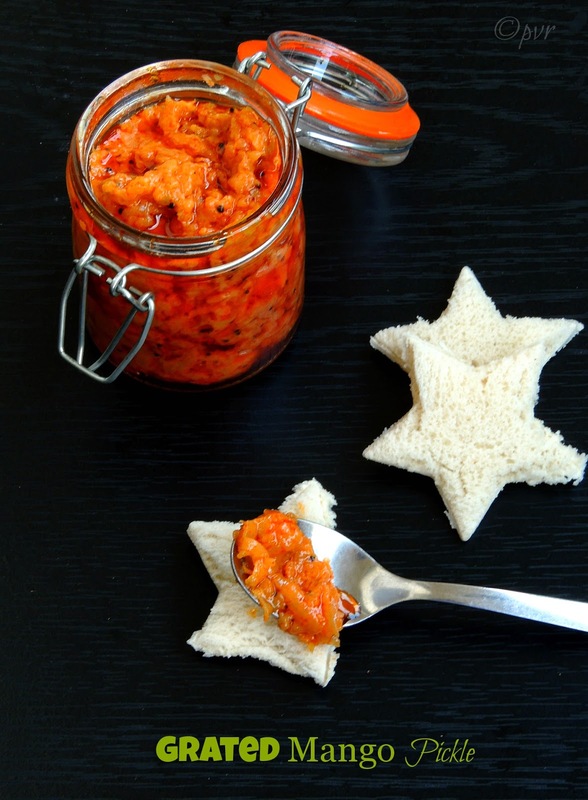 As a spread with some toasted bread slices or even as a side dish along with a simple curd rice, this pickle is definitely very addictive. Do select some super sour raw mangoes to prepare this pickle and am sure this pickle will definitely tickle your tastebuds.Check out the Blogging Marathon page for the other Blogging Marathoners doing this 28th edition..
Add the grated mangoes,salt,chilly powder and saute everything for few seconds. I cant imagine my life without dal based gravies,especially the kootu. Kootu served with rice topped with ghee and fried papads are my all time favourite. In case if i run out of veggies or if i have veggies abundantly,i'll quickly make kootu with it. Few days back, i prepared this fabulous,comforting kootu with bottlegourd,mushroom and peanuts. Peanuts gives an excellent nuttiness to this usual kootu and both bottlegourd and mushroom works out wonder in kootu.Give a try friends, am sure this kootu will definitely satisfy your tastebuds.Sending this kootu to my event CWS-Peanuts and Viji's SYSW Series - Bottlegourd & Fenugreek Seeds. Grind the coconut and cumin seeds as fine paste and keep aside. Take the washed channa dal, washed moongdal, chopped tomatoes, bottlegourd pieces, chopped mushrooms,raw peanuts with turmeric powder,enough water and salt in a pressure cooker. Once the whistle get released, add the coconut-cumin seed paste, garam masala powder and slit opened green chillies to the to the cooked veggies-dal..
Bring everything to boil(add water if needed). Meanwhile heat enough oil, let splutters the mustard seeds, urad dal, dry red chillies and asafoetida powder. Add the chopped onions and curry leaves, sauté until the onions turns slightly brown. Add this onions and tempered spices to the cooking dal. Finally add the lemon juice and put off the stove.. Enjoy with rotis & rice..
Baking is one of my stress burster, i can bake for hours and i love it. Actually while chitchatting with some of our buddies, suddenly we planned to start a baking group and this is how this beautiful Home Bakers Challenge, our new baking baby group was born. Every month a host will give her choice of bake and bakers from this group will bake the posted recipe within a month, between 10th -12th of each month we will post our tried recipes in our respective blogs. How easy na, yep anyone who love baking or to experiment their baking skills can join their hands with us. For our first month of Home Bakers Challenge, the host of the month Divya Prakash of Divya's Culinary Journey chosed Pizza with 4 varieties, one with pizza sauce while the another one is without pizza sauce,the third one is with pesto sauce and the last but not the least is naanizza, an Indianized version of pizza with naan.I chosed pesto pizza and baked few mini pesto pizza with homemade basil and walnut pesto with our family favourite veggie broccoli. Each and every baker of this group can chose their toppings with their favourite veggies or cheese,watever this group members are really very amazing and they baked varieties of pizza with beautiful toppings.Thanks to Divya for suggesting us pizza for the first bake of this group and we loved it. Combine flour,sugar and salt in a bowl,drizzle in olive oil until combined with flour. Next, pour in yeast-water mixture and mix until just combined. Coat the dough with olive oil, then cover the bowl tightly with plastic wrap and store in the fridge until you need it.It’s best to make the dough at least 24 hours in advance, and 3 or 4 days is even better. Take enough pizza dough,roll it as small sized circular discs. Transfer the rolled pizza dough to a baking sheet placed over a baking tray. 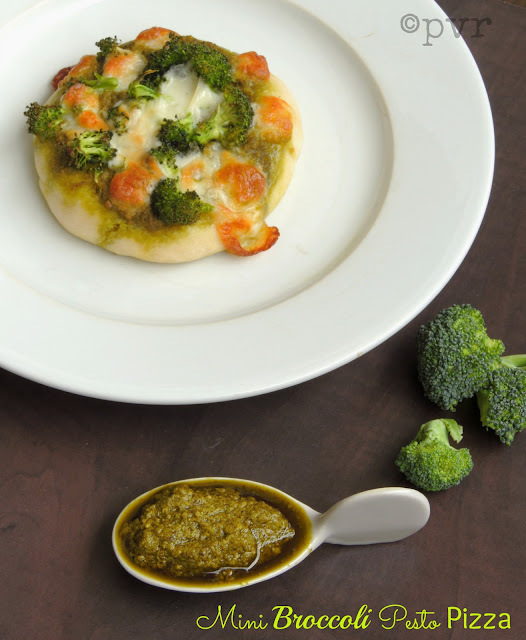 Spread the pesto sauce to the rolled disc,arrange the broccoli florets over the pizza base finally sprinkle the grated cheese over the veggies. Bake this vegetarian pizza in the middle rack for 20-25minutes until the cheese melts. Coming to my today's recipe its completely a vegan,nutritious,protein packed healthy stir fry. 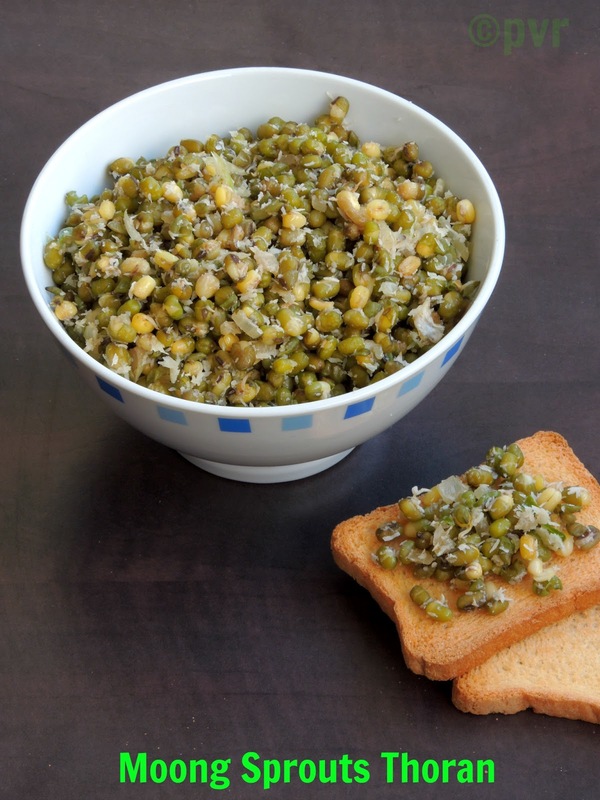 Moong sprouts are excellent source of many nutrients, this thoran is a simple stir fry with usual spices. Serve this thoran with hot piping rasam, you will definitely love this combination and both together tastes absolutely divine.Easy breezy stir fry gets ready easily and you can enjoy even as a simple snacks, yep i usually finish them as a snack if there is any leftover after our lunch.Sending to my own event Healthy Diet - Cooking with Sprouts guest hosted by Roshni. Heat the oil, let splutters the mustard seeds,urad dal and curry leaves, saute the onions until they turns transculent. Now add the cooked moong sprouts, grounded paste and salt,cook until the moong sprouts gets well coated with grounded paste. Serve as side dish with rice,rasam and dal. 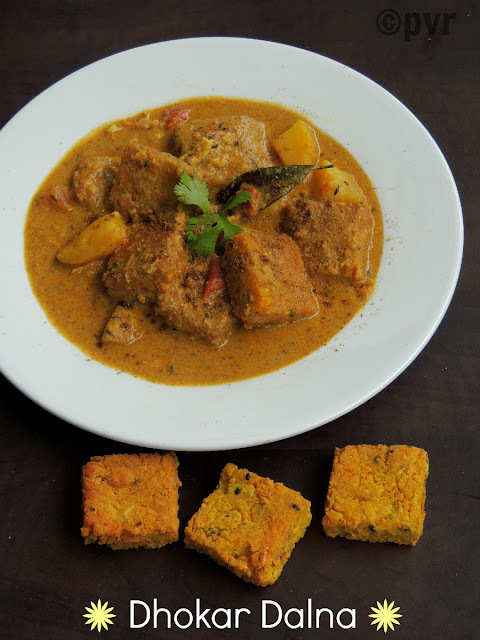 Dhokar dalna is a traditional Bengali lentil cakes curry which is served during pooja or as a part of a meal.This lentils cakes cooked in tomato, coconut milk and cashew raisin paste is a pure Sativk dish, that means this dish doesnt need neither onions nor garlic. This dish is also served during special occasions like weddings to the widows who are not allowed to intake onions and garlic. This dish in my to do list since a long, but somehow i wasnt able to do this dish and taste them.This dhokar dalna is a favourite dish of most of the Bengalis. Dhoka means' to cheat' in sanskirt and still is a mystery why this dish is named as though. Even Bengalis doesnt know the reason for it. Yea some dishes doesnt need the meaning of their name,wat we all need is the taste of this dish na. Am enjoying rite now this dish with rice as my lunch, trust me its seriously mindblowing,delicious,super flavourful and nutritious on the same time. 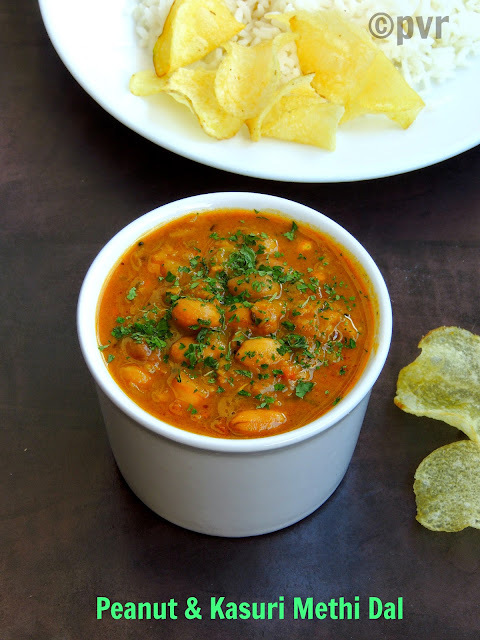 Every first of the month, i'll be posting a North Indian dish as am a part of the famous South vs North challenge, an event started by Divya Pramil of You Too Can Cook. The motto of this event is to exchange an Indian recipe between two teams. One team is Southern team (bloggers born and brought in South India) and the another one team is Northern team (food bloggers born and brought in North India). 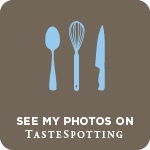 Every first of a month, a blogger from each team will challenge a recipe from their origin and the opposite team have to cook the recipe challenged by the other team. For our this month's challenge, Nabanita Das of Esho-Bosho-Aahare challenged the Southern team with this famous Bengalo Dhokar Dalna while Roha of Hyderbadi Cuisine challenged the Northern team with a rich and droolworthy Qubani Ka Meeta,the fmous Hyderbadi apricot dessert. Both challenges are mindblowing and love to make some Qubani ka meeta too soon. Soak the channa dal, split greenpeas or split yellow peas (not the toor dal neither fried gram dal) for 4hours. Now grind the soaked dal as coarse paste with green chillies. Add the onions seeds,ginger paste,turmeric powder,salt,grated coconut,baking soda to the grounded batter. In a kadai, heat the oil, fry the asafoetida powder, add the batter and stir continuouly in simmer until the batter turns thick and get off from the bottom of the kadai. Transfer the cooked batter to a greased plate, flatten them and keep aside to cool. With a knife,cut the cooled batter as any shape as u desire. Deep fry now this sliced pieces until they turns light brown colour and keep aside. Soak the raisins and cashew in hot water for half an hour, grind as fine paste and keep aside. Heat 2tbsp oil, add half of the turmeric powder, salt to the cubed potatoes, fry it in the hot oil until they turns crispy,remove from the oil and keep aside. Heat the remaining oil in a kadai, now add the asafoetida,cuminseeds, bay leaves, fry until they turns brown. Add the slit opened green chillies,ginger paste and fry for few minutes. Add now the chopped tomatoes and fry everything until the tomatoes turns mushy. Now add the red chilly powder,cumin seed powder,garam masala powder,turmeric powder to the cooking tomatoes and cook for few more minutes,until the oil comes out. Add the grated coconut,coconut milk to them and cook for few minutes. Finally add the already prepared cashew raisins paste,fried potatoes,cook again everything in simmer until the gravy turns bit thick. Add water if need to adjust the gravy consistency. Finally add the fried lentil cakes, sprinkle the garam masala powder on the top,cover and put off the stove. Once the fried lentil cakes are added to the gravy, dont forget to the serve the dish, else the gravy will turns thick. While frying the lentil cakes, be careful some make break,but dont worry. Am here again to host my own event Cooking with seeds, the host of this month was bit busy with her personal life and she couldnt able to guest host this month's event. Obviously am hosting this month's event, without any delay this month's seed choice is Peanuts. You may think whether peanut is a seed or a legume,but peanut is a fruit,a seed and a legume at the same time. Peanuts are well known as ground nuts, eventhough they have so many other names like earthnuts,monkey nuts,goober peas and pig nuts.Peanuts are not nut eventhough they looks like nuts but they are a legume. Peanuts are rich in energy and have so many health benefits like nutrients,minerals,antioxidans,vitamins which are quite essential for our health. These nuts are excellent source of Vitamin E and minerals like manganese,copper,potassium,calcium,iron,selenium,magniesum and zinc. 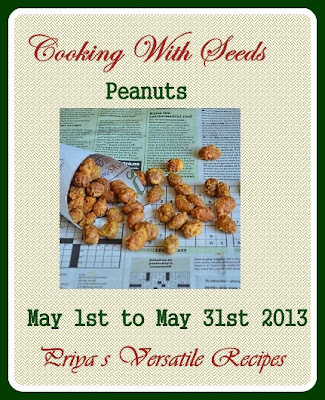 If you are cooking anything with peanuts,dont forget to send me, so that many peoples around the world may learn to cook or bake with peanuts. Peanuts either raw,cooked,roasted or as paste like peanut butter can be used. 1)Cook, bake or create dishes with peanuts as anything(vegetarian, vegan or non-vegetarian are accepted)..
6)Once you are done with your peanut recipe, dont forget to link it back to the linky tool attached below. Please take care to send all ur entries before 31st May 2013.